Finally airing on BBC4 tonight at 9pm. It would seem the facebook group that resolved to stop anyone seeing this didn't succeed unless they have another cunning plan up their sleeves. 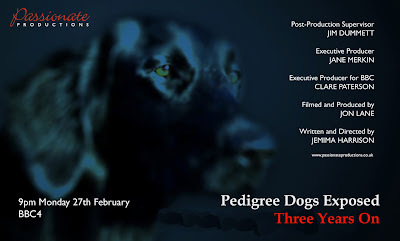 "Three years ago, Jemima Harrison exposed pedigree breeding practices that left many dogs with severe health problems. Since then, she's become a campaigner for canine welfare and now she revisits the issue to see if anything has really changed. Although there have been some improvements, she uncovers a depressing lack of progress. Flat-faced breeds such as pugs and bulldogs may look good enough to win prizes in dog shows, but sadly they're struggling to breathe. 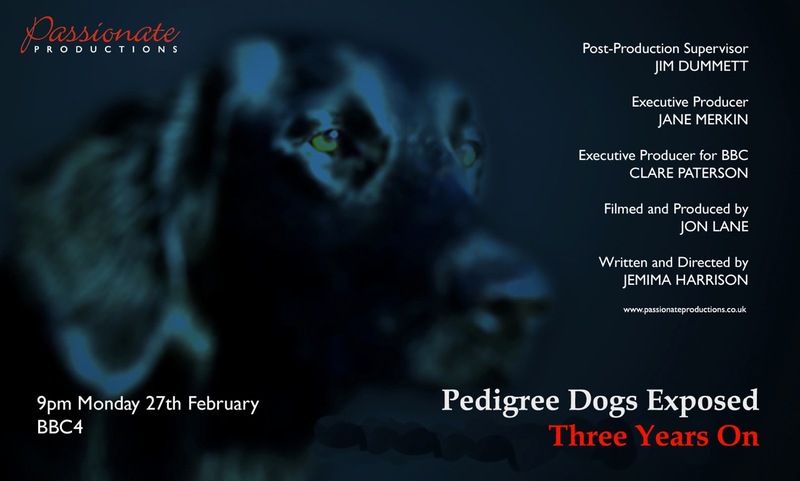 Hannah Verdier"
Jemima Harrison’s 2008 documentary on the health problems of pedigree dogs prompted the BBC to cut its ties with Crufts. This revisit suggests not much has changed since: she can still offer plenty of heartbreaking examples of pedigrees – mainly pugs, bulldogs and King Charles spaniels – with agonising associated medical conditions, explained in grim detail by their attendant vets. Despite all this, the Kennel Club’s alteration to its guidelines has been nothing if not conservative. From the article in yesterday's Mail on Sunday: "The new programme is to focus on the poor health of pugs and bulldogs, flat-faced dogs known as brachycephalic breeds. These dogs often suffer from blocked airways. 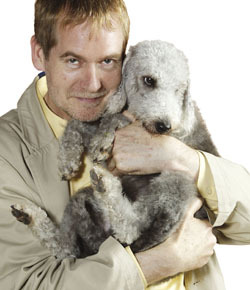 In 2008, Jemima Harrison’s shocking documentary condemning canine inbreeding resulted in the Beeb refusing to broadcast Crufts. In this follow-up film, she reveals what’s changed and, alarmingly, how little hasn’t for poor little pugs like George and Cissy, whose rosette-worthy faces come with a host of highly debilitating health problems. Again, Harrison makes a compelling, sickening case for change. And if you miss it - it'll be on the BBC iplayer and also repeated on BBC HD at 11pm on Thursday March 1st. Wow, what a program. Very sad to see there are still pedigree dogs being bred for looks rather than health. That Boxer story was shocking, I feel so sorry for the dogs that died so young. And that dog is STILL Being advertised as stud! Very sad program all round. I had hoped she would mention cross-breeding though. I know of so many people who watched the first program and went to BYB's of various crossbreeds to get a 'healthy dog' rather than a pedigree one. She could have mentioned than cross-breeding isn't exactly the way to go, they should still come from health tested parents if you want a crossbreed. am sure you saw another programme regarding the KC ethics? Also for your information I am totally against what the KC stand for and so are my breeders. Not one of our puppies are registered with the KC as we refuse to line the pockets of people who promote irresponsible dog breeding. All our pups are bred as companion pets and all our breeders are licensed with their councils. This is unfortunately the downside to Jemima's program, a lot of people are seeing KC registration as a bad thing, and are gravitating towards puppy producers such as this person. Please let the next program be on how to recognise a good breeder with healthy " fit for life " dogs, and not another round of breeder bashing. Of course there are bad breeders, and I can assure you, the good breeders want them gone just as much as Jemima does. Anyone know how I can watch this as missed it on TV and on iplayer?